Hannah's House San Diego, California - Help Our Community Thrive! In the words of St Augustine, "peace in society depends upon peace in the family." This has been our philosophy and our vision for the San Diego community since our inception. Make a donation today to support the Hannah’s House Safe Passages Project, which provides multiple supportive and therapeutic services that wrap-around parents and children who have experienced domestic violence and family breakup. We guide them through this difficult life transition. This project serves low-income parents and children who lack access to justice in the Family Court and the safe and secure family interventions needed to ensure brighter futures for the children and for the parents through our network of family programs for positive parenting and co-parenting. Founded in 1988, Hannah's House is the only nonprofit in our county providing critical services to families in crisis because of unexpected loss or change in the family. We get involved as early as possible to help families cope effectively with crisis, and provide stability for the sake of the children. Some of our families become involved in Family Court and the transition of family separation. The services offered by Hannah's House are critical for children caught up in the midst of family crisis. This process makes everyone in the family feel vulnerable. These at-risk children are immersed in family turmoil and crisis - their parents feeling overwhelmed and overburdened. Hannah's House is here to help. Children in the midst of crisis need a sense of safety and security, and at least one caring adult the child can rely on for assistance in coping with their feelings and managing anxieties. 1. Our first program is a Supervised Visitation and Exchange Program that serve families referred from the multiple Family Courts in San Diego County. 2. Our Human-Animal Bond Program creates spontaneous and positive connections for children estranged from their parents, and for children and parents struggling with loss and change. 3. Our Transitions Family Program offers positive parenting/co-parenting classes; anger and emotion management classes; substance use disorder assessments and treatment; individualized adult/child therapy; reunification therapy; co-parenting therapy; and a variety of family therapies designed to bring healing to estranged family relationships. 4. Bridges Family Program offers home and community-based services that help our families make safe and healthy adjustments: home studies, home safety/welfare checks; infant/toddler care classes; and Parent-Child Interactive Therapy. 5. Our Family Resource Center directly connects our families to community resources such as housing, childcare, employment, transportation, food banks, medical/mental health resources and education resources that address the critical basic needs of each family member. Our wrap-around services preserve and strengthen family ties. The resources of our families are depleted when they arrive at our doors, and we are the safety net for these vulnerable families through our comprehensive network of support. 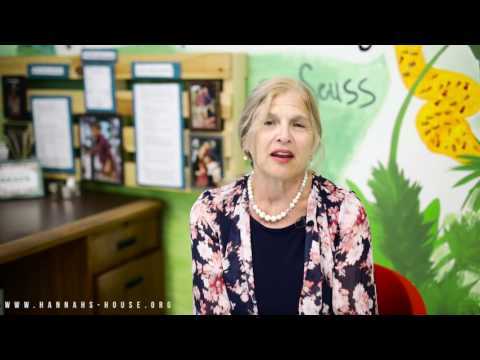 Donate today to support the Hannah's House Safe Passages Project which helps children learn the critical skills they need to cope effectively with family crisis including, the important skills needed to go back and forth between Mom's House and Dad's House with competence and mastery. Each donation of $100 will provide critical wrap-around services for a family of four for one week. Over 600 families, every month in our County file for the protection of a Domestic Violence Temporary Restraining Order, and Hannah’s House is the only secure facility in the county providing these crucial services. Join with us today to become a Champion of Children!